An astronomical saving is most appropriate for this wonderful family-friendly space game, and today that’s absolutely the case. 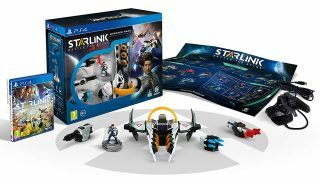 Right now you can pick up the Starter Edition of Starlink: Battle for Atlas - which includes a real life toy version of your ship as well as several items to adorn it with - for only $20. This offer applies to both the PS4 version available at Amazon and the Xbox One version available at BestBuy. This starter pack version of the space-exploration game incorporates the virtual and the physical by including actual build-able and modifiable toys that you can interact with in the real world while experiencing them in game in the virtual world. It’s a fun take on bringing a videogame really to life in your hands and makes it extremely accessible for the whole family. We really liked it and you can see why in our review here. You can get it for Nintendo Switch with a pretty chunky discount, but it's not quite as generous as the PS4 or Xbox One offer: it’s just under $30 instead at Amazon, but that will still save you 60% off the list price which is still a great deal. While you’re on the hunt for a bargain, make sure check out the best options for current cheap PS4 deals and cheap Xbox game deals.